This is a delicious, light, refreshing dessert. It's low cal and sugar and can be made with the lite pie filling in any flavor. Note that this needs to be made the night before to soften the graham crackers. This is a delicious, light, refreshing dessert. 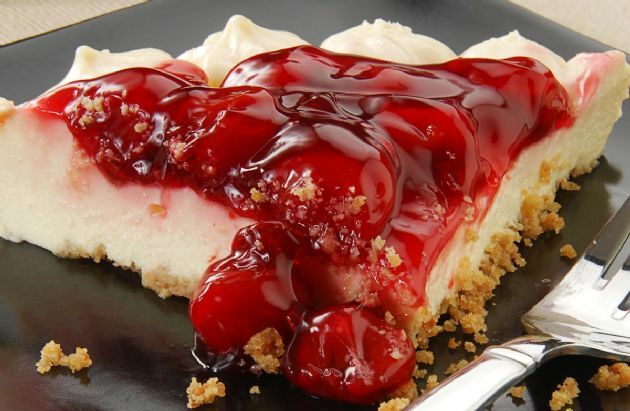 It's low cal and sugar and can be made with the lite pie filling in any flavor. Note that this needs to be made the night before to soften the graham crackers. Line the bottom of a 9 x 13 pan with whole graham crackers. Beat the cream cheese until smooth. Add milk and lemon juice to the cream cheese and beat until smooth. Stir in pudding mix, then fold in Cool Whip. Spread 1/2 of cream cheese mixture over graham crackers. Repeat with another layer of graham crackers and cream cheese mixture. Spread pie filling over top. OH MY DEAR SWEET LORD !! !.....I made this with cottage cheese instead of cream cheese. (the beating smoothed out the lumps) Fool me once....fool me twice....fool me over and over again with this recipe ! I will be makin' this many, many more times.FABULOUS ! !